I can't say for certain, but in terms of movie genres, the coming-of-age film has got to be among, if not the most popular of them all. To its numerous examples, let's add yet another -- SOMEDAY THIS PAIN WILL BE USEFUL TO YOU -- which turns out to be one of the better, if odder, examples of the genre. It is also the third movie to open this week -- following The Oranges and Butter -- that features a starry ensemble cast of seven principal players. Go figure. This movie also sports an interesting history (which you learn about in the interview that follows this review), starting with its choice of director -- Roberto Faenza, shown at left) who more than anyone, I suspect, got this project off the ground. 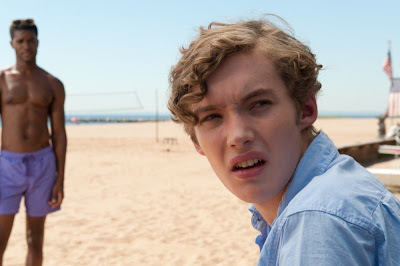 The film -- with its lengthy but rather appealingly ironic title -- was written by Peter Cameron (The City of Your Final Destination), together with Mr Faenza and Dahlia Heyman, and tells the story of a young man whose divorced parents, pre-occupied and self-occupied, are not doing the job they should be with their offspring. Left to his own devices, the kid does some dumb things, some smart things and -- fortunately for us viewers -- some very entertaining things. However, and this is key to the success of the movie, nothing here goes over the top. There's little melodrama, and no crazy comic antics. (This is not Running With Scissors.) The tone -- exactly right, I think -- is measured, a little distanced, and rather thoughtful. 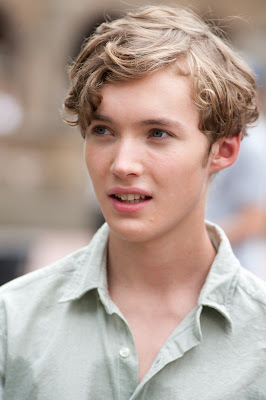 Our hero, James, is played by an attractive and very sensitive looking young actor, Toby Regbo (above), and while it is his movie to win or lose, he is helped immensely by the expert ensemble cast around him. 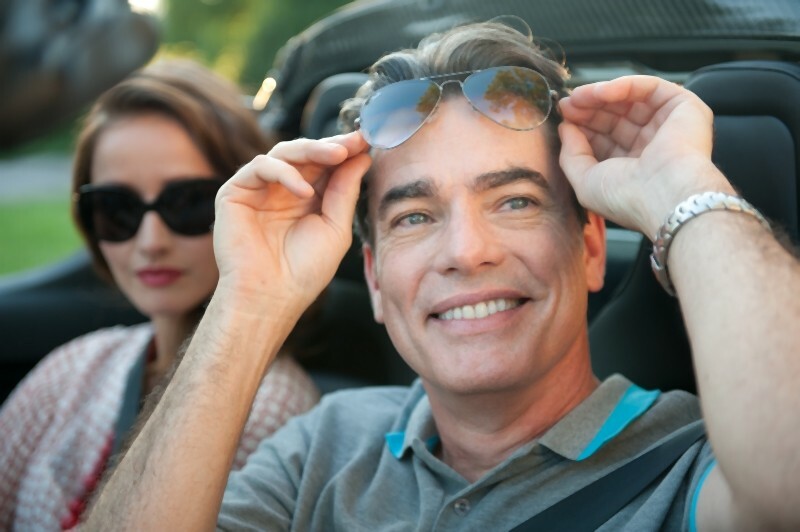 These performers include Peter Gallagher (above) as James' dad, a high roller who tells his son, over lunch, "It's not manly," after the kid has ordered a salad as his main course. (The movie is full of these precise, telling details.) His mom, Marcia Gay Harden (below) runs an art gallery offering some of the stranger installations you'll have seen, and since she herself has never grown up, she can hardly help set her son's course in that direction. 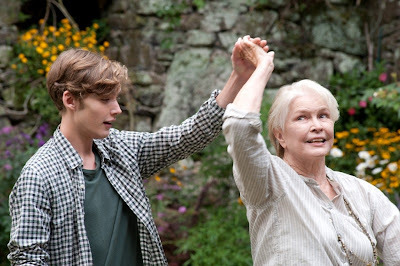 Grandma is played by a fine Ellen Burstyn (below, right). Clearly, James comes from a moneyed family, and while dollars don't solve everything, they can sure as hell help in a pinch. 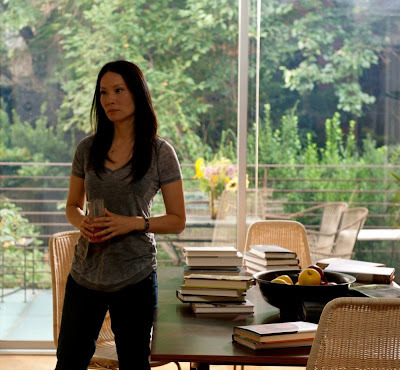 Pinches come thick and fast in the film, one of which has James seeking help (he is forced to, of course) from a most interesting life coach (Lucy Liu, below), who again, plays things straight and avoids the more oft-used route of farce or frenzy. The scenes between Regbo and Liu are lovely, as is so much else in the movie. 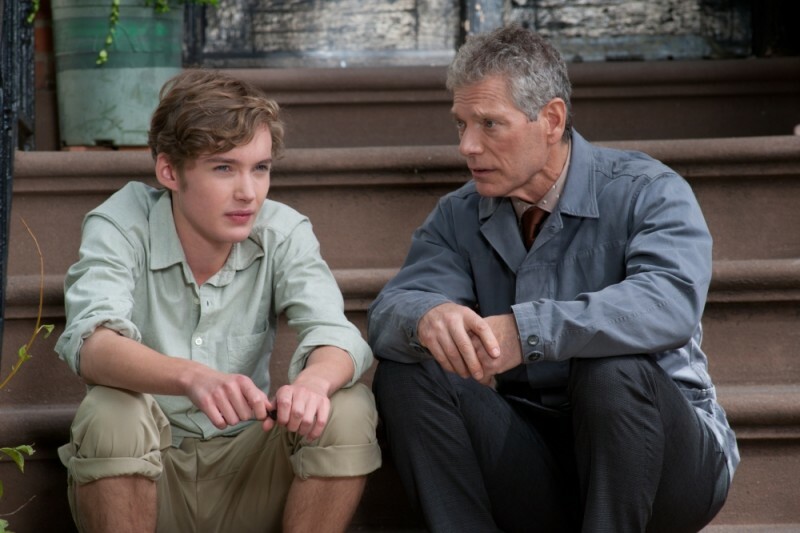 "Else" would include some fine work from Stephen Lang (below, right, with Regbo) as mom's latest squeeze, a decent enough fellow, except for his gambling problem. Completing the ensemble is Deborah Ann Woll as James' older (and, like her mom and dad, utterly self-involved) sister. I make no claims of greatness for this coming-of-age movie, but I am pretty certain that audiences who discover the film will not be disappointed in what they find. Someday... (you'll probably not see much more than this on most movie-theater marquees; well, maybe Someday This Pain...) -- from Film Buff and Four of a Kind Productions and running 95 minutes -- opens this Friday, October 5, in New York City at the Village East Cinema, and simultaneously on VOD. Signore Faenza, first I want to tell you how much I enjoyed this movie -- one that takes the usual coming-of-age theme and handles it with unusual flair and thoughtfulness. When I looked at your resume on the IMDB, I discovered that you appear to have made a movie about Sabina Spielrein and Carl Jung a full decade before David Cronenberg did his version! Oh–-yes, The Soul Keeper. I wanted for 23 years to make this film, because we discovered the connection between Sabina and Jung and Freud, and I went to Russia to discover more about her, but we were prohibited at that time, and so we waited more and more. I wish we had been able to see this film over here – and several of your other films, too. The problem here in America is that it is difficult to have foreign films released. I also did a film in New York called Cop Killer (but it was called Corrupt here in the states). And another movie called Look to the Sky. Yes, that’s actually in my queue on Netflix! But I didn't realize that you had directed it. 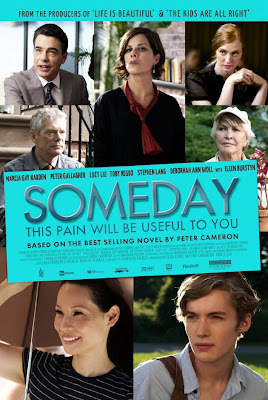 So let’s talk about Someday... How did you come to direct this one? The book was published first in Italy and then in America. When I read it I was familiar with the story, for it reminded me of Catcher in the Rye, a book that every filmmaker would love to have taken to film. I talked to the writer and found him amendable to my doing the film. Then money was raised both in Italy and in the US to make the film: 60% from Europe, 40% from America. The casting director, Avy Kauffman, was particularly helpful in opening so many doors for me. There is not a lot of opportunity in America for European filmmakers and their crews, because it is not allowed to use Italians on the crew. Only two crew member out of 105 could be from Italy. We should work more on changing this so that we can freely move between crews from both countries. I agree completely. It's time for more cooperation across the boards. Let's talk about the tone and the lovely consistency that movie has. Nobody too cute and quirky and over the top. How did you manage to not do this – as this is a trap that so many coming-of-age movie fall into? I think the reason everything looks correct is that we have a look at the conflict between teens and adults. In the film I felt that we needed to be more protective toward the adults that most likely you, our character James, and the audience do not like. I understand that it is not their fault that they are the way they are. It is the way they were made. I tried to communicate this to the actors, and especially to Toby, who plays James, the lead character. It looks to the adults like James is abnormal, but this is not true. It is they who are not normal. The Catcher in the Rye in the father of all the novels of this theme. But when it was written, the world was a different place. Now this has all changed. Because, in the time of that author the world was not bankrupt as it is today. I take it that by "bankrupt," you mean not just economically. No, morally and socially. I don’t know anybody who likes the future we face. That future is really bad. The fact that the this world is coming and that you cannot be happy in this world affects our young people, I believe. There is no hope – and for this reason I believe that we should listen more to the young people. Because it is they who will suffer most from this situation. First of all, where does your name come from? From Norweigian extraction, kind of, but shortened. You played the young boy in Glorious 39. (Editor's Note: This is a film you all should see!) How was it to work with Stephen Poliakoff? Really amazing. And to work with that cast of the best British actors! It's not often you get that kind of picture of WWII. Poliakoff is so dense with ideas. Yes, and he shows what war can do to a family and how war can tear people apart in the worst ways. You were also in Lone Scherfig's film, One Day? With Matthew Beard: We play a pair of horrible brothers who try to ruin her Anne Hathaway's date with Jim Sturgess. What's your favorite film so far? Mr. Nobody is probably the favorite thing that I have done so far: my first real experience with working with cinema. The director, Jaco Van Dormael, is an unbelievable visionary. There is a bit in his earlier movie Toto, the Hero, where you see the protagonist walking through the city where the background looks kind of futuristic. Mr. Nobody is the final realization of what he wanted to create in that scene, but did not have the resources to do. It’s an amazing film of parallel lives in the same universe and how they interact and connect. Boy, I wish we could get the chance to see this film, but it has not been released here in the U.S. yet. You know, when I saw Someday... I had no idea you were British because your America accent was quite good. I had a dialect coach for three weeks, and that helped a lot, but then you kind of have to forget about it and just do it or else it affects your performance. Everything in the movie had the right tone. That was quite an accomplishment, I think. You have to try to be honest and play it real. Otherwise no one believes you. Were there any times the director had to scale things down – not your performance, because you are the quietest person on screen – but some of the other actors? No, no. They are talented and professional people. And they knew what they were doing. They were wonderful and they all made us feel welcome. Can we talk about your upcoming work? There's Treasure Island -- where I get to play a pirate! Right -- and I noticed something called uwantme2killhim? Yes! Brian Singer produced it, and it's directed by Andrew Douglas. It's based on an amazing true story, so it’s going to be quite something.